One of Wally and Linda West's twin children. Her connection to the speed force has caused her to age rapidly. Additionally, she discovered that she and her twin brother shared a connection to the speed force. She has recently taken the mantle of Impulse. Iris West and her twin brother, Jai, were born to the third Flash, Wally West, and his wife Linda Park. 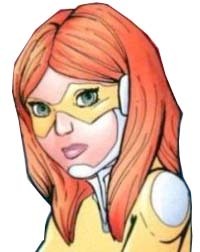 Although the twins were initially miscarried as the result of an attack by Zoom, Linda's pregnancy was miraculously restored during a later battle. When Wally went into the Speed Force during a battle with Superboy-Prime, he brought Linda and the infant twins with them. After spending some time on an Earth-like world inhabited by an alternate version of Jay Garrick, they traveled to another planet occupied by technologically advanced aliens who had had dealings with a Flash in the past. When they were first born, Iris and her brother exhibited no signs of having inherited their father's powers. However, after turning three months old, their metabolisms sped up and they began to age rapidly and exhibit powers. Their alien hosts taught Linda the basics of operating machinery to stabilize the growing twins' powers. The West family was suddenly brought back to Earth during an adventure involving the Justice League, Justice Society of America, and Legion of Super-Heroes. They moved back to Keystone City, and Linda set up the alien devices in their basement. Afraid that the twins could age to their own deaths sooner rather than later, Wally began training them how to use their powers as heroes, hoping to let them live their lives to the fullest. While aiding their father battle Spin and Gorilla Grodd, Iris and Jai were captured by Brother Drive and Brother Think, two members of the Dark Side Club who claimed that the twins were Forever People with great potential. Immediately after capture, Iris began to experience another rapid growth spurt, aging her to late adolescence. This gave her full superspeed like her father, which she used to free herself and Jai. After helping their father defeat Grodd, she had yet another spurt, aging into adulthood. She continued aging rapidly, becoming an elderly woman. Wally sought the help of Nzame, an infant gorilla with healing abilities, to try and halt the process. However, this plan backfired, as Iris seemingly withered away and died before her family's own eyes. However, this turned out to be simply a hallucination created by Grodd. Though alive, Iris was still quite old. The twins' rapid aging was cured when Wally discovered that their genetics were not the cause, but rather the death aspect of the Speed Force. He brought them both into the Force. While there, Wally drew the blackness out of her, turning her back into a girl. More than Jai, Iris is a living conduit for the Speed Force, with absolute master over it almost rivaling the one briefly gained by her father during the Dark Flash Saga. Mind-controlled by Queen Bee, she exhibited the power of forming "cocoons" of Speed Forces, bubbles in which she could control speed and time, freezing her targets or hastening their metabolism to death. Moreover, she repaired the weakening connection to the Speed Force crippling her father. Badly traumatized by her ordeal, she refuses to give in her powers again. again in her full potential. 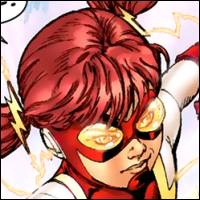 Iris embraces her new role with childlike glee, choosing to take up the mantle of Impulse, which Bart used before he joined the Teen Titans as Kid Flash. • Accelerated Healing - Speed Force conduits are not invulnerable nor durable enough to sustain damage however if they are harmed they will heal at high speeds. Any normal wear and tear damage to their bodies are almost instantly healed. • Decelerated Aging - Speed Force conduits have a slowed aging process. This power can be imparted on their most intimate loved ones by extended contact rather than distribution. • Energy Construct Creation - Speed Force conduits can use the matter generated by their speed to create solid objects such as walls or bridges. This power requires constant concentration and reapplication of the construct for it to remain stable. Flash's after images are also construct creations. • Flight - Speed Force conduits can rotate their arms and spin their bodies like tops to achieve something of a kind of helicopter flight. However, with practice conduits can even achieve controllable flight if launched at high speeds. Despite their flight abilities they are always faster on their feet. • Increased Perceptions - Speed Force conduits traveling at the speed of sound may miss important events as they run by. The Speed Force grants them enhanced senses that allow them to see, hear, smell, touch and/or taste at an increased speed and understand it as it is processed. • Infinite Mass Punch - Speed Force conduits have an increased level of strength added to their bodies which they can impart in different ways. Certain speedsters can strength each and every move they make however this requires attention and stress for each movement and therefore is almost never used. In most cases conduits can focus the Speed Force's extra-dimensional energies into one massive punch; when used in practiced this punch pushed a metahuman from one continent to another. • Phasing - Speed Force conduits can vibrate their molecules so quickly that they can achieve intangibility for short bursts allowing them to phase through objects. • Self-Sustenance - Speed Force conduits travel at incredible speeds which cause their bodies to work overtime. In situations where their bodies may be too fast for them to breathe they may impart on the Speed Force for sustenance. However, this almost always results in the conduits having an increased metabolism at all times requiring them to constantly refill their energy supplies. • Sharing the Force - Speed Force conduits can allow their friends or family members to run along side them at their equaled speeds. Certain conduits who may only have minor access to the Force may achieve full levels of the Force due to the main conduit's association with it. • Speed Force Aura - People who are propelled by the conduits during high speed situations can survive the harsh conditions associated with mach speeds. When the conduit must rescue an individual from a burning building these individuals will be protected while within the aura. • Speed Force Conduit - People who, for whatever reason, are connected to the Speed Force are sometimes called Speed Force Conduits. This means that they are connected to the Speed Force and are tethered to it. Some characters may control their Speed Force imparted powers in different ways such as only Superhuman Strength or even directed through Lighting but no matter their adaptions they are still connected to the Force. • Steal Speed - Speed Force conduits can steal the accelerated motion or momentum from objects or people to reduce their speed or even virtually stop them. Conduits may also steal the speed from other Speedsters or other fast moving people. • Supercharged Brain Activity - Sometimes neglected by Speedsters who only operate at superhuman speeds and never slow down enough to understand their full potential; Speedsters can access superhuman levels in their brains further than processing information. They can test theories, understand difficult equations and run trial and error in their brains at superhuman speeds. Different conduits access this activity in different ways. • Superhuman Endurance - Speed Force conduits have to access the Speed Force for a number of different tasks. Most Speedsters use their superhuman speed and react at superhuman speeds; therefore, they must run for extended periods or operate for a large amount of time. Their bodies can handle the stresses of superhuman racing without noticeable distress. • Superhuman Speed - Speed Force conduits have one main ability above all else. Conduits are connected to the barrier and accumulation of all Speed known in their universe. These characters immediately understand how to run at superhuman speeds and their bodies instinctively understand how to react at high-speed situations. Older speedsters have a reduced but maxed speed of 770mph which is just below sonic booms allowing them to react to situations without causing civilians undo stress. Speedsters in their prime can travel at much faster speeds such as the max level of recorded aided speed on Earth and even reach the speed of light with enough willpower. It is possible for conduits to travel much faster than the speed of light however such levels require an incredible amount of stress. Speedsters unaccustomed to their max level of speeds may detach themselves from the Speed Force or even become part of the Speed Force by accident. • Vortex Creations - Speed Force conduits that plant themselves on the ground and rotate their extremities can cause an incredible amount of wind to burst through their focused funnel. Most Speedsters use this ability automatically when they run reducing the air currents around their body to low enough levels to no longer inhibit their speed. Creatively, Speedsters can create tornadoes and gusts with their arms.